My daughter has a large collection of Care Bears, purchased in the early 2000s by her mother. I love these little bears, but thought some were a little far removed from the original collection of Care Bears from the 80s: Bedtime Bear, Birthday Bear, Cheer Bear, Friend Bear, Funshine Bear, Good Luck Bear, Grumpy Bear, Love-a-lot Bear, Tenderheart Bear, and Wish Bear. I mean, really, who is “Share Bear” or “Harmony Bear”? These must be the politically-correct cousins. Anyway, I always thought Grumpy Bear was underrepresented. I’m generally a happy person, but sometimes I’m just masking a melancholy undercurrent of holiday anxiety. 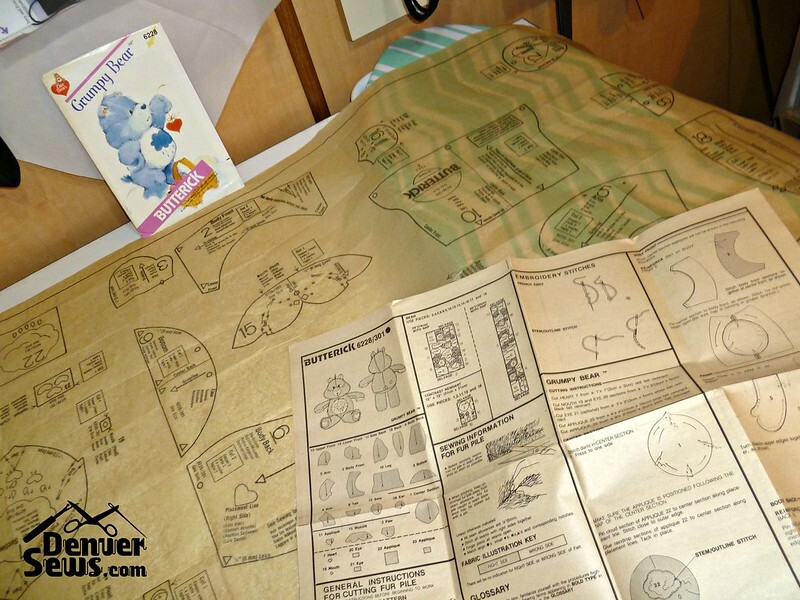 Anyway, a vintage challenge is a fabulous opportunity to finally make that Grumpy Bear pattern I purchased on eBay a few years ago (Butterick 6228). And if you don’t believe it’s vintage, try and decipher this copyright year: MCMLXXXIII. My Grumpy Bear pattern consists of 23 pattern pieces. Some are for the blue fur and some for the white fur. 6 pieces are templates for appliques or felt pieces for the eyes and nose. I’ve made stuffed animals before and I knew this pattern would be a bit of work with small, stretchy, furry pieces and tight curves. I used a nice bit of blue fleece-like fabric that I found in some remnants bin and a piece of white costume fur my daughter found at Hancock Fabrics. 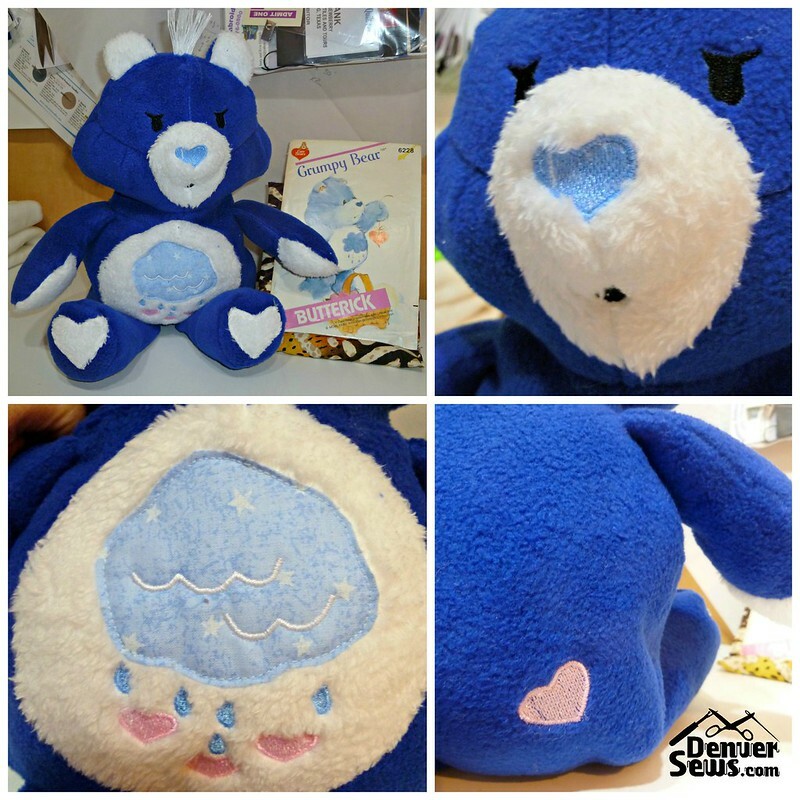 I chose not to use felt for the nose and other embellishments, choosing instead to use the scanning and digitizing features of my Brother Dream Machine to machine embroider these embellishments directly on the bear. 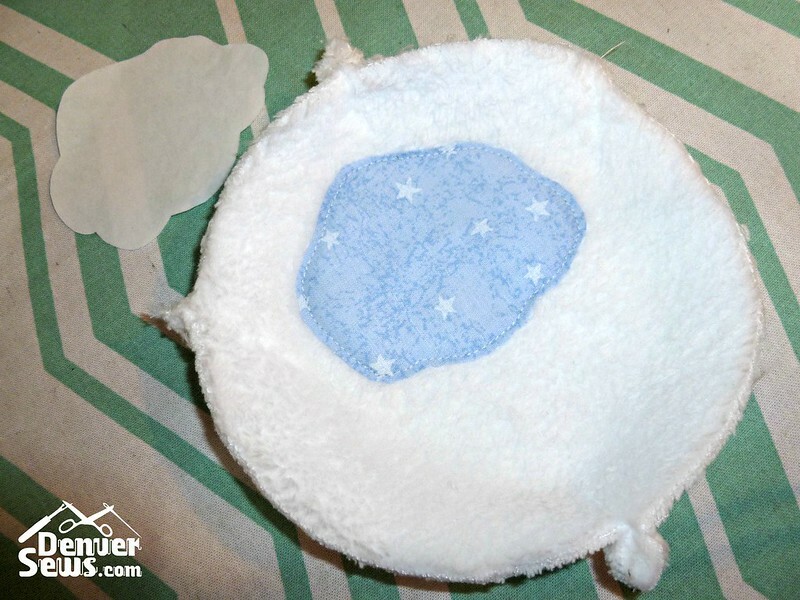 First I used the freezer-paper applique method of making Grumpy Bear’s cloud. I cheated and just top-stitched the cloud to his tummy. For the embellishments, I used my Dream Machine. 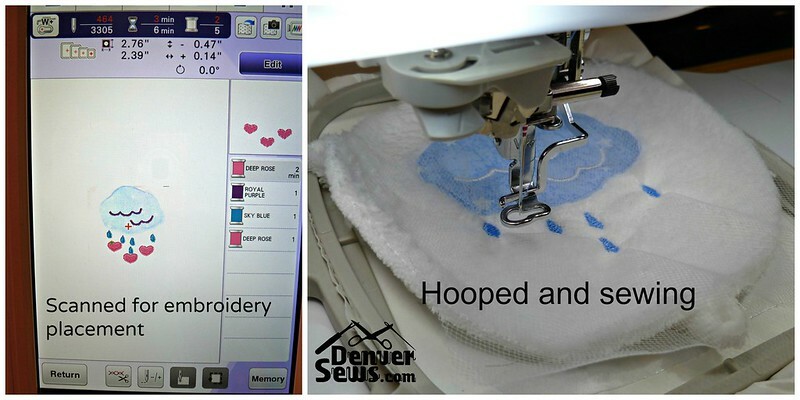 See how easy it is: (1) draw the shapes I need digitized onto tracing paper (2) scan the tracing paper (3) use My Design Center to color in and digitize my drawing (4) scan the hooped tummy so I can position the embroidery, and (5) voila, it’s done! I used sticky-back stabilizer and white tulle as a topper. 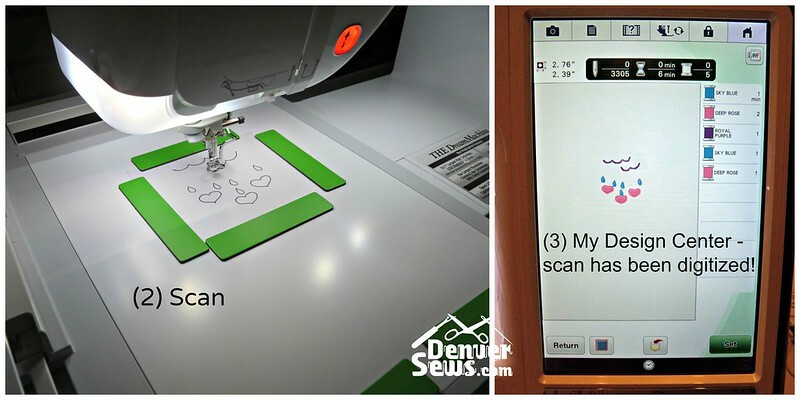 In case you’re not familiar with the fabric scanning feature on the Dream Machine or other similar models, use the button in the upper right corner of the screen with the Camera (2nd from the right) to scan whatever you have in the hoop. Then use the Edit button to move your design around so that it is where you’d like it. In the photo above, I’m in the Embroidery screen. 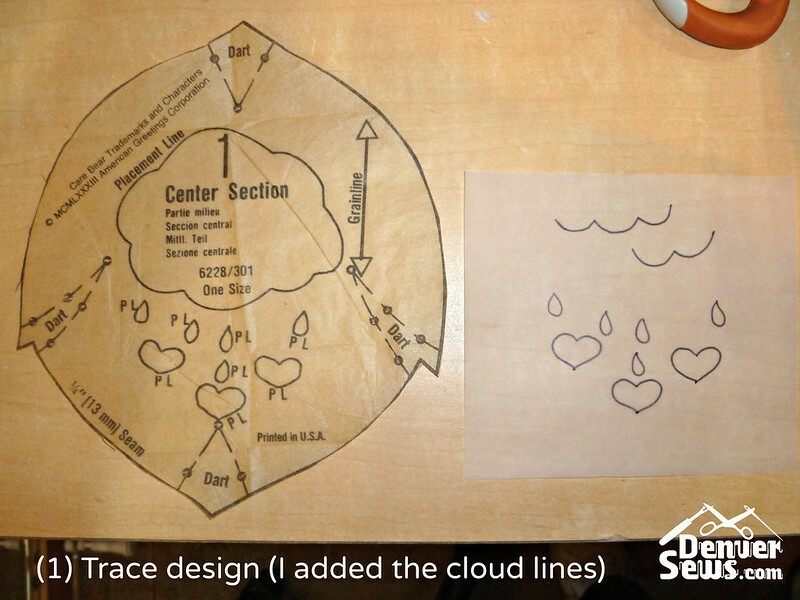 As for using your scanning feature with My Design Center, you can read about it here. Well the Care Bear is all finished. You can see where I used my Dream Machine to embroider his little snout and the heart on his backside. The heart is not perfectly filled, likely due to the stretch in the fabric. 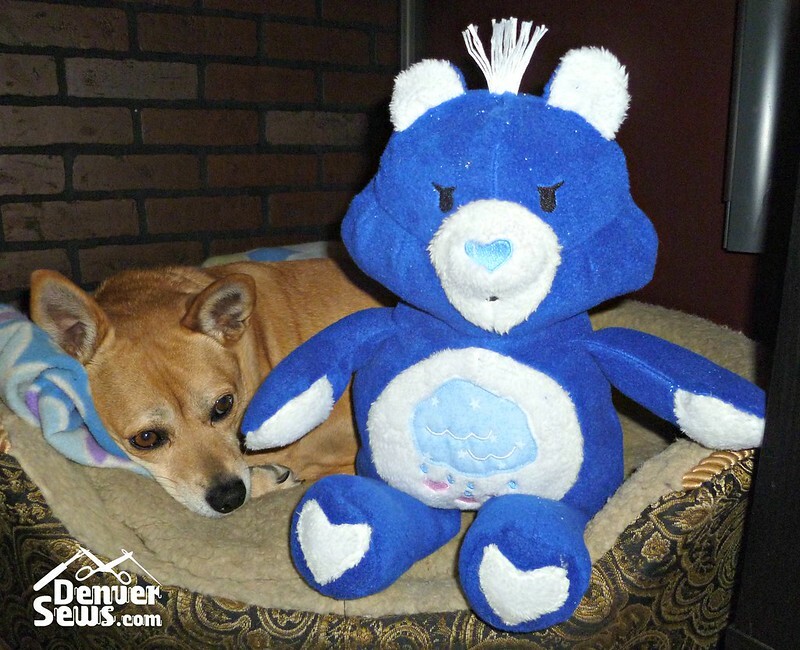 These older Care Bears have a more angular head with jutting cheeks and a pointed forehead. The newer Care Bears are a little more round. I like this “original”. I think I could have done a better job with the shaping of his snout and maybe something different for his eyes. But for now, he’s just fine. 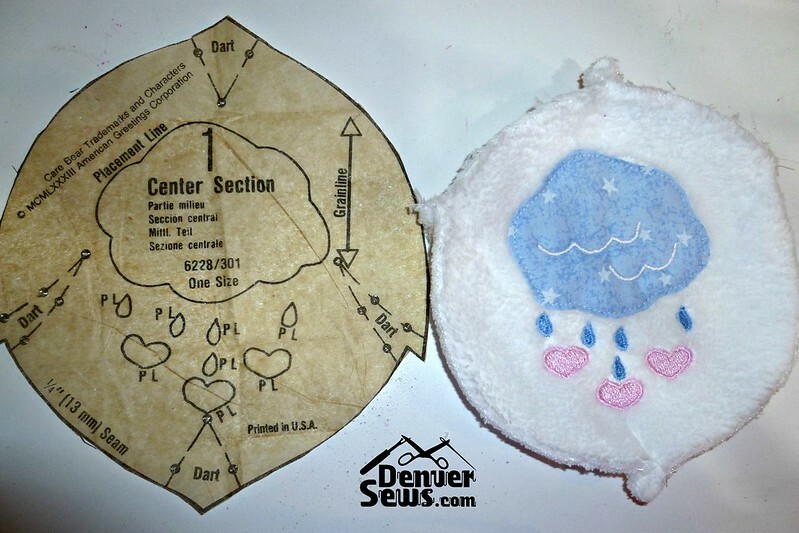 And in case you don’t know what his story is, it’s this (from the pattern envelope): Grumpy Bear’s tummy symbol of a rain cloud with falling hearts is his unspoken reminder that even in spite of our occasional grouchy moods, we are still loved by those closest to us. Previous The Vintage Sewing Challenge! It’s the cheekbone seams that make him look mean. PS–Do you remember the cartoon character Joe Btfsplk, who always had a rain cloud over his head? Grumpy Bear’s cloud and raindrops remind me of him. What a fabulous post! I love the photo, with Ginger Pickles looking like she might get a little grumpy herself, if Grumpy Bear hangs around too long. I have to get back to exploring the DM embroidery features again soon. He’s so cute. My daughter loved all those guys too. Love the embroidery. Adorable! The machine embroidery really took it up a notch! I love the photo with Ginger Pickles looking worried that her bed might have to be shared with Grumpy.